NIC representatives attended the National Centers of Academic Excellence in Cyber Defense Reception and Designation Ceremony at the National Cyber Summit in Huntsville, Ala., June 6-8. 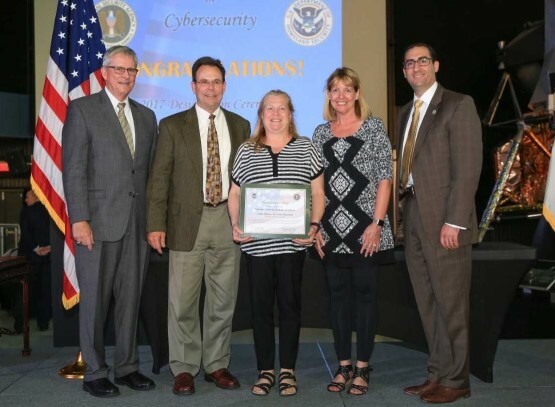 Pictured are, from left: Leonard T. Reinsfelder, commandant of the National Cryptologic School National Security Agency; NIC President Rick MacLennan; Kathleen Czurda-Page, NIC Computer Information Technology instructor/Cyber Defense program manager; Sue Shibley, NIC Business and Professional Programs division chair; and Daniel R. Stein, acting branch Cybersecurity Education and Awareness Office of Cybersecurity and Communications Department of Homeland Security. North Idaho College has earned a highly selective designation as a National Center of Academic Excellence in Cyber Defense 2-Year Education, which opens doors for more federal grants, programs and job opportunities. NIC is the only community college in Idaho with the CAE2Y designation. Cybersecurity courses are part of the curriculum in NIC’s Computer Information Technology program. The CAE2Y institutional national designation was established by the National Security Agency and the Department of Homeland Security, with the support of the National Science Foundation and CyberWatch West Center for Cybersecurity Education. Sue Shibley, NIC Business and Professional Programs division chair, said the designation is the culmination of 18 months of submitting documentation, building a website, upgrading content, aligning curriculum with new competencies and working with an assigned mentor. For more information, visit www.nic.edu/cybersecurity or call (208) 769-3448 to schedule an appointment with an adviser.